Lawrence Abrams at BleepingComputer has the full story. As I warned in Computerworld yesterday, the currently optional (but soon to be pushed) patch KB 4493132 carries with it the lovely retro payload shown above. See the BleepingComputer report for full details. Somebody remind me of the definition of a Potentially Unwanted Program. UPDATE: I’m getting notes from various people — including JR Raphael, via Gregg Keizer (Hi, JR, Gregg!) 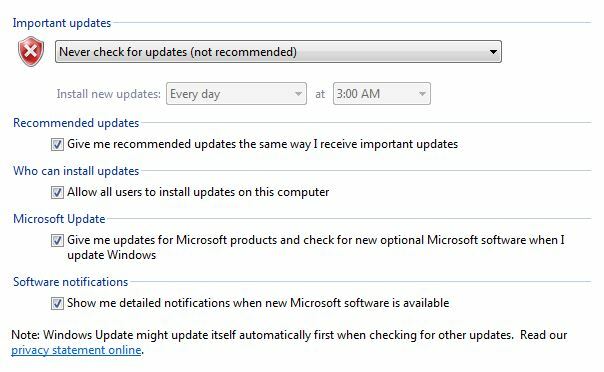 — that KB 4493132 now appears as checked and Important in Windows Update, at least on some machines. @abbodi86 now notes that the nagware payload won’t be offered to Professional, Enterprise and Embedded editions of Win7. RDRguy 3 weeks, 1 day ago. How is it any different? Just curious because I’ve never had any problems with installing Windows 7 on UEFI. The only difference of 7 UEFI is that it doesn’t support Secure Boot, because Secure Boot didn’t exist at the time. Otherwise, I’ve never had any issues installing 7 as a UEFI OS. zero2dash: I m curious, because I have now Windows 7 in dual boot with Linux Mint. Do you mean that with this kind of setup one can no longer boot Win 7 in protected mode, or something else? Thanks. UEFI is the firmware itself, as opposed to the old fashioned BIOS. Secure Boot is a function of a UEFI system that can be used, but is not required. Secure Boot is a Windows-only thing that was introduced in 8 and included with 8.1 and 10. No Linux distros support Secure Boot and (AFAIK, all of them) require it to be disabled to be able to boot and install Linux. So, did you write the above by mistake, when actually meaning to write”BIOS”, not “UEFI”? At least in my own experience, one can access the UEFI in a Windows 7 PC by hitting, repeatedly, one of the function keys right after turning the machine on and beginning to boot Windows 7. In my case, the key is f10. Edited later: Oh, I just found out that “secure boot” is not the feature I was thinking of, one that is available in the Win 7 UEFI, but something else that did not become available in the UEFI until Windows 8. Sorry about this confusion. Apparently was earlier than 8.1. This is incorrect. Most major Linux distros do support secure boot, and work just fine with it enabled. I have it enabled on both of my Linux laptops that have secure boot as an option, and both of them boot Kubuntu and Neon without a problem. My desktop PC, even though it’s UEFI, does not have secure boot functionality, so of course it’s not enabled there. So far, I have yet to see this one show up in optional or critical. Is it possible that it’s being hidden in the monthly roll up on some machines ? It is being released as a separate patch. Do we know if this is making it’s way to WSUS? As always, thanks for the heads up, Woody. 1) In the past, those of us using Win7 Enterprise have been spared these “courtesy notification” patches. Will we be spared them again? 2) Will removing the SipNotify executable stop these notifications, or will they, like “The Walking Dead” keep returning? See @abbodi86 ‘s post here. More importantly, I hope MBAM remember their definition and quarantine this update. “Somebody remind me of the definition of a Potentially Unwanted Program.” More importantly, I hope MBAM remember their definition and quarantine this update. My thoughts exactly (since the GWX era)… Or are anti-malware software developers afraid of Microsoft? Lovely. Thanks, PKCano and abbodi86. They are panicking because millions of us W7 users are not going to switch so they are neglecting W10 in the mean time to concentrate on harassing W7 users. Stick with Windows 7 if you so choose. You have that right. But, don’t whine when tools you use all the time, especially browsers, are no longer supported. Just get the source code and make your own updates if there’s still a compiler that runs on Win 7. Software developers do not have a choice. They MUST move on. If you really want to stick in the past, go back to Windows 3.1 or even DOS 6.1. Above all, make sure you have lots of aluminum foil under your clothing. And, get off the Internet. THEY are after you. For me, I hate the nagging that will probably happen to Pro or domain joined computers. 10 out of 80 workstations at the office are Windows 7. Yes I have a plan in place to either replace or upgrade them before EOL. But what I don’t need is Microsoft bugging my users about it. 10 emails and walkups of “hey I got this popup while I was eating paint chips, is this a virus.” So to avoid that I have to decline updates and block an exe and track that Microsoft isn’t changing what I blocked. You assume people resent 10 for privacy only, and that’s factually incorrect. A lot of people (myself included), dislike 10 for taking control out of our hands on whether we install updates. I am running a full 10 Pro shop at home, multiple machines, and yes, I’m using deferral periods and CBB designation. However ~ I still cannot pick and choose updates with what is baked in to the OS. (I can with 3rd party tools, but that should not be what is necessary to do the job.) That irks me. I love 10, it’s fantastic, but I want control to be given back, at least for Pro and above SKU’s. Indeed Windows 10 is marvelous and I am quite happy with it, however what you can properly hate are feature updates. Of the reasons why many of us won’t or can’t move off Win7, at least not yet, it’s only a small portion who are resisting due to “conspiracy theories.” And frankly, it works fine for most things and I really see little reason to upgrade for the average person (potential security issues aside). Forced upgrades for no legitimate benefit, but a lot more complexity in the update process. Most who have resisted this long and have ANY awareness of how computer work are well aware how software dev cycles often work. But for those who, like me, manage over 200 desktops and over 400 total devices across four offices, by myself, I NEED those Win7 laptops running as long as possible because we simply CANNOT upgrade all of them until their time is up. Not something the junior helpdesk kids can handle. Just can’t happen, not with fifty other priority items that are overdue. This is typical of our (sys admins & engineers) workloads, something developers never care to consider. Nor anyone else in a company. Microsoft & Apple constantly makes our lives more and more difficult with their games. Can’t wait to get out of this industry, after 25 years my ulcers will thank me. Edited for content. See Lounge rules. Says who? Several of the projects I’m working on work all the way from Windows 10, back to Windows 2000. A few even run as far back as Windows 98. A friend of mine maintains a huge project that runs on multiple platforms, of which one of them is (surprisingly) Windows 95. Tools I use all the time haven’t changed much, if at all. The two oldest tools I own work on everything from Windows 10 all the way back to Windows 98 (MIRC and Winamp). Notepad++? Works on 98. Vim? Version 7 even ran on Windows 3.1 I hear. Infact looking at many of my tools right now, I know that most of them can run on at least Windows 2000. Lets see how aggressive the push of this “update” is going to be and if this update ignores the never look for updates setting. I admin my own and many other Windows 7 computers of family and friends. All those are set to never look for updates. I do not plan to switch to Windows 10 on any of those computers. I would not be happy if I start to get calls left and right about this message should it override the do not look for updates setting. Again I say might ignore the do not look for update setting. I do not say that it will ignore the do not look for updates setting! Because at this time we do not know how it is going to behave. It is pure speculation at this point. If this update remains a separate “standalone” patch as PKCano noted here & my experience with it noted here, then all you need to do is treat it like the infamous KB2952664 Telemetry Enabling Patch — you hide it and keep re-hiding it whenever it reappears. Is Microsoft going to offer free updates from Windows 7 to Windows 10, if so when? This is strictly a nag notification of Win7 EOL, not an offer of free upgrade. If I remember correctly, a couple of months or so before XP reached EOL, M$ pushed out patch KB2934207 on 3/5/14 that kind of did the exact same thing on XP. The KB article for it is no longer available on the M$ support site but a discussion thread concerning it can be found at answers.microsoft.com. That’s ignorant. 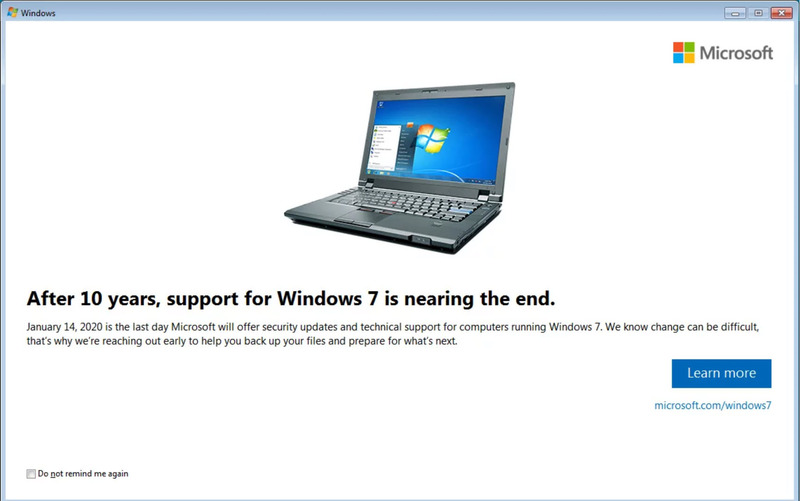 Microsoft really wants to get people to buy Windows 7-8. Basically the offer still stands and has never ended. All you need is a valid Windows 7 or 8 key. Microsoft will add a “digital license” to your Windows 7 or 8 key. So that you can continue to use that Windows 7 or 8 key if you ever need to reinstall Windows 10 in the future. You can deactivate/unregister a RETAIL Windows 7 or 8 key and use it for Windows 10 on a different computer. There is no need to unregister a key when upgrading to Windows 10 on the same computer. Note this does not work for OEM or COA licenses as they are hardware bound for use on one system only! You should however be able to use the upgrade to Windows 10 with a OEM key on the same computer. I do not know if it also works for COA keys as they are used a lot in refurbished computers. This was however not the way COA keys were meant to be used. Many people forget to unregister their Windows key when they reinstall on a different computer and then run into activation problems because the Microsoft servers think the key is still in use with the old computer. actually deactivates the key on Microsoft’s servers? Or does it only removes the local activation for a key replacement? Any Microsoft source? I have no source. But you can find multiple versions of this guide and forums talking about it. So far I have not run into a situation where this did not work but that is a personal assessment. I have not logged my network traffic to see where or if a connection is made. Can be used to register a product key. To do that successfully you have to have contact with the Microsoft servers. Or else the this version is activated message will not appear in the system menu. Will indeed remove or rather unassociate “I am sure Microsoft never deletes user “information”” the key from that system. The problem is that should online activation fail when you used a key multiple times. Then you are at the mercy of who ever you get on the line when trying to activate by phone. This person may not have had his best day ever and flat out refuse to grant you your activation even though your perfectly entitled to it and are using a legit key. The above unregistration command should prevent that. Then again Assumption is the Mother of All F*** Ups. So if anyone can shed some light into the true workings of this than I would be most grateful. The Windows 7 desktop image on that notification generated by KB4493132 reminds me of at least two things that I love about Windows 7: the beautiful translucence under the Start menu; and the tasteful right panel on the Start menu that’s filled with useful links to folders and features instead of blinking tiles and fluff that I will never use extending halfway across my screen. Users who do not want to switch to Windows 10 will likely be forced to install Linux. If you don’t have a copy of Windows 8.1 lying around, I’d suggest Linux Mint 19.1 Cinnamon. It’s great for at least everyday use and I swear by it. One of my PCs runs it and I could clone it (and all of its installed programs) to my Windows PC. Incidentally, I tried Mint with both Cinnamon and XFCE (because I was advised that XFCE was lighter on old hardware) but I found that Cinnamon ran as fast as I needed it (no worse than Win7) and presented a more familiar visual experience. I know people will probably hate me for saying this, but I think a new free offer of Windows 10 would help Microsoft achieve their goals at this point. It’s very likely that people would be more willing to upgrade as 10 has matured and due to lack of support in Win7 coming up. The problem is that I wouldn’t trust Microsoft to do it correctly. The right way to do it would be to offer it to show the offer in the nag screen, but genuinely let people choose “never show this again” and do it. At the same time, release an online ad campaign telling people about the free upgrade. Just make sure it remains 100% a choice. But Microsoft would probably foul it up if they did this, forcing upgrades on people, making it harder to say no, and just making the nags as annoying as possible, making people resentful again, rather than seeing it as helpful. And the mess of the last time will still make people wary anyways. Isn’t the problem with Microsoft offering free upgrades again that they are advising users not to upgrade existing devices? I somewhat agree with Microsoft about getting new hardware. The security context has changed significantly in the last few years, and most can’t ensure their hardware is supported in addition to hardware, firmware, management engine, CPU, drivers, software is secure. There is no easy way to check if your system is not vulnerable to attack. It’s out of reach to most. The sensible recommandation (from the Windows 10 point of view) is to get hardware manufactured for Windows 10 and still fully supported. My recommendation has always been to install manufacturer-supported versions of Windows. Unless, of course, you have the required knowledge to take the entire responsibility for securing, troubleshooting and fixing your otherwise unsupported systems. Many AskWoody readers can do it, but not everyone. The Bleeping Computer article sums up pretty much all of the relevant, known info about KB4493132. I’ll just add my 2 cents (wild guessing thoughts, I suppose). -Phase 5 starting on December 5. Microsoft will probably release updated cabinets (eventually with other images and text) before each Phase starts. The metadata also provides a tip on what might be the reason why not many users are “getting” this lovely Phase 1 retro payload (as Woody puts it) yet: Microsoft appears to be planning to push it worldwide using geofencing technology. 241 //  0xF1 -> ? 222 //  0xDE -> ? 219 //  0xDB -> ? Speccy, this may be right; checked again just now and it’s nowhere to be seen on my WU. Hate to burst your bubbles but yesterday (3/21) late afternoon I manually updated my Windows 7 Ultimate x64 desktop with the 2019 Feb & Mar Security Only, IE11 & KB4474419 (SHA-2 support) updates, then a reboot, then installed KB4490628 (servicing stack update) & followed up with another reboot. After system power-up & my subsequent manual WU check, I was offered KB4493132 (unchecked) along with the expected monthly rollups (1st Mar then Feb), MSOffice, MSRT, Defender & the .net update. I hid the Mar rollup & KB4493132, rechecked WU, hid the Feb rollup, rechecked WU then installed the remaining MSOffice, MSRT, Defender & .net updates. Maybe having the Mar servicing stack update installed triggered being offered KB4493132. I guess all that can reasonable be done, at this time, is to wait and see how this works out. If clicking once on the request not to see the message again in its present form is enough every time when a new version of this patch comes up, and these new versions are not forcibly installed without the users’ explicit and affirmative intervention, then, at worst, this might mean seeing a new and somewhat different version of this message showing up once every two months, for this particular version never to show up again after clicking on its “do not want to see this again” button. Most people could live with that, I imagine. For my part, besides Windows 7 (which I have under repairs for an unexpected problem) I have now, besides a new-ish Mac laptop, also Linux Mint in double-boot with Win 7 in my originally Win 7-only PC. So I think I am reasonably prepared already for the changes ahead. Others might be wise to also begin preparing themselves now, in whichever way they want to do it. Win7 SP1 Home 64-bit; Office 2010; GrpA, when all is said, done and fixed, Mac OSX to help me sleep at night. I think you are revealing the future. We use Linux, VMs, Chromebooks and Macs for something we can ‘just use’ and an M$ OS for hardware, specific software and work purposes. Although I share a house with some with a Surface Pro 4 and has never had a problem, acting bemused at my battles with Win10. It seems to depend on the hardware and uses. That’s OK when you can do that. My 7 box is used to run things that collect data using web-scraping. The line of least resistance will be to upgrade. The machine is old but uses an early i7 quad-core so is still fairly fast and does not need to be replaced. The main concern is that Win 10 will not have compatibility issues with the ancient hardware. Everything else is solvable with a bit of effort. The machine is old but uses an early i7 quad-core so is still fairly fast and does not need to be replaced. The main concern is that Win 10 will not have compatibility issues with the ancient hardware. It should not be a problem. Windows 10 has a good array of drivers for older gear, and I can tell you that it installed and worked fine (without any dangling ! marks in Device Manager) with my Core 2 Duo laptop (older than any i7) and my Sandy Bridge desktop (which is still my main desktop PC), which is the second generation of i5/i7s. You won’t know for sure unless you try it, or research whether it has worked for others with your PC model, but the odds are pretty good, I’d say. Windows 10 works great on some older hardware and not others. I have an old Vista-era Dell XPS 630i that won’t run Windows 10 due to compatibility issues. The display subsystem turns off randomly and cannot be awakened without a hard restart, no matter what power saving or video settings I use. Some necessary video and motherboard drivers just don’t exist for that machine, and I have found no tweaks from expert sites that work. If I put a non-NVIDIA card in the 630i box, Windows 10 might work, but the machine runs Windows 7 or Windows 8.1 like you wouldn’t believe, and I will stick with that. I have two other old 32-bit Vista-era machines about the same age as the 630i that run Windows 10 1607 well with only 2 GB of RAM. Windows 10 1703 choked on both of those devices and they will stay on 1607 for the life of the machines. Windows 10 1703 choked on both of those devices and they will stay on 1607 for the life of the machines. Yeah, 1703 was like that, at least some of the builds were. 1709 was a marked improvement in that regard, though not better than 1607. I have an old Vista-era Dell XPS 630i that won’t run Windows 10 due to compatibility issues. That seems to be typical for Dell. I mean, when I see mentions of this, it’s Dell more often than market sales of new units at the time when the devices were new would suggest. Can one not simply make the scheduled tasks go away or change their schedule to never run or something? Can anybody tell me how this update is different from KB2934207 for Windows XP? I never installed it on any XP machine, so I don’t know how similar or different they could be. Though I for one think that, on the surface, it would appear to be the same. But I have to take into consideration that there was never that really hard push by M$ to force people onto Vista as there was & still is to get people onto Win10. As such, I need to remain vigilant. That’s bizarre…. Pro doesn’t get KB 4493132, but Ultimate DOES? I wonder if the folks in charge even know about Ultimate…. what happens when I run an OEM or retail version of Win7 SP1 Professional? will KB4493132 be offered thru windows update? I’ll have to check this on my relative’s Dell Inspiron 580 desktop machine running Win7 Pro OEM to find out. Edit 3/22: Wow, I just ran WU moments ago and KB4493132 is not being offered on Win7 SP1 Pro OEM on the Dell computer. phew, that machine is safe from the nagware…for now. I haven’t figured out why some machines don’t get the KB offered, why some see it as Optional/Unchecked, and while others see it Important/Checked. Can anybody else discern a pattern? I thought it had to do with the “flavor” of Win 7 – starter, Pro, Ultimate, etc. I’ve checked 2 Pro machines and neither has been offered the nag patch. It seems that quite a few folks here have reported the same on their Pro machines. I’ve checked a Starter machine and the nag patch IS offered to it as unchecked. My impression is that the folks here who have reported it as being offered don’t seem to say whether they’ve got Pro, Ultimate or whatever. Maybe someone can prove me wrong or right. Multilanguage support and BitLocker, without the volume licensing hassle of the Enterprise edition. Not common at all, but known to exist. See the main post… I’m now getting notes from various people that KB 4493132 now appears as Important and Checked in Windows Update. Poised to getcha. are they sure they don’t have this setting checked? Can confirm it is unchecked in the important updates for 32-bit (Home) and 64-bit (Ultimate) hardware installs for me. For me, this update has not yet arrived. Reading above: Windows 7 Professional doesn’t “acquire” this update. Thanks very much! This is of course subject to change as we get closer to the actual end date–MS may decide that even professionals need the reminder or that users will act as surrogate nags, calling in panic when they get the nag screen–but it’s nice to know that for now I’m not going to be nagged by this. KB4493132 is not available in the MS update catalog, not that I want it or anything. Is this by design on their part? I’m assuming it’s by design. Regrettably, another instance of where MS does not have our best interests at heart. Even worse, when users have to resort to “guerrilla warfare” to defend our machines from MS–does the third-party software to prevent the auto-install of Windows-10 come to mind? You may have bought your your machines and it came with Windows pre-installed but that doesn’t mean you own your copy of Windows. Microsoft owns Windows. People lease it. Microsoft’s DOES have our best interests at heart. When Win7 reaches EOL it will become increasingly vulnerable to malware. It is their responsibility to tell us. What they have wrong is not the message but the nag. I am glad they warn people about EOL. So much computer stuff goes EOL without users even knowing (routers anyone?). A simple nag is good. A full-on GWX behind your back install of Windows 10 after you clicked the red X to close the window is not. Don’t forget the AskWoody crowd is different than most users. Most users need to be helped in computer security stuff. They don’t have an IT staff to look out for them. Warning Win 7 users about EOL is ok , but recommending the update as “Install this update to resolve issues in Windows..” is NOT ok.
that’s assuming the KB4493132 update will get at least a revised V2 version that shows the nags on Win7 Pro edition. so far, those using embedded, enterprise & pro editions (whether oem, retail or VL of Pro) of win7 are exempt from the nagware. Microsoft just wiped blogs[.]technet[.]microsoft[. ]com/serverandtools/ including tens of thousands valuable blogs, posts, and tips & ticks of the last 15+ years without notice. Thanks, but it’s about highly valuable technical posts and blogs from well-known experts (inside and outside of Microsoft), not the utterly useless garbage hosted at docs.microsoft.com. Earlier this year, the Windows content experience team moved all Windows 10 technical documentation from TechNet to docs.microsoft.com. The next phase of this project has begun. Starting today, the technical documentation for Windows 8/8.1, Windows 7, and Windows Vista will also be available on docs.microsoft.com. Don’t worry – the information you need to support older versions is still available, and any existing bookmarks will automatically redirect. Is it searchable from a regular windows help page? There is now a second thread about KB4493132 in the Microsoft Answers forum for Spain. A user is reporting (and 16 people have indicated they have the same question) that two of his computers experienced error code 80070643 when trying to install KB4493132. The moderator’s instructions for fixing the issue haven’t worked. Yes, the update (KB4493132) is showing up in the March update as Important and already checked. Ironically (and somewhat deceptively) the description states “Install this update to resolve issues …”. One must click on the “More information” or “Support information” links to see the real reason on MS’s website. All of the above just more reasons why my Win 7 MSI laptop is soon to become a Linux Mint 19.1 machine. My Acer Aspire Win8.1 will continue to do the heavy lifting. I’m not seeing the update at all on my Win 7 Pro machine, even after checking for updates and it does not exist on my machine. Incompatible hardware? I did run SURT about 18 months ago to repair a problem then removed and hid it again after it did the job. Possibly there’s a key in Registry? I haven’t figured out why some machines don’t get the KB offered, why some see it as Optional/Unchecked, and while others see it Important/Checked. Can anybody else discern a pattern? Here’s a snip it of KB4493132 listed as important unchecked. ETA: I have no idea where the huge smiley face came from????? Do you have this setting checked ? So Microsoft assumes those who bought Pro and Enterprises already know and understand the end of support deadline but those who didn’t need endless reminding. Edit 3/27: I can confirm that KB4493132 is being offered again on Windows Update after I hid KB4493132 almost a week ago. Born was right about it being re-released. Yes, it’s showing up on my Win7 Ultimate as IMPORTANT CHECKED. where’s the x86 (32bit) version? Following my previous post on this topic a quick, preliminary “sneak peak” into the binary not only confirms abbodi86‘s disclosed findings (here and here) but it also provides additional insight: the IsBlockedSku built-in check appears to be dormant for now (it will only kick in once the metadata.json file is updated with a new BlockedSkus section – which doesn’t exist, yet). This subtle, but enlightening shift of focus (from presenting EOL support information first, at the top of the page to a page that dives straight into a blatant consumer marketing campaign) raises a few red flags, if you ask me – contradicting PKCano’s optimism (it sure looks like GWX v2.0 is coming up… hopefully I’m wrong). IMHO it is a very good reason to hide, block and ignore KB4493132. Unfortunately for RDRguy, his decision to go ahead and install the March Servicing Stack Update (SSU) KB4490628 (despite Woody’s MS-DEFCON system advising to wait and hold back while we’re still at MS-DEFCON 2) might have been a really bad idea. Back in October, I posted about the KB3177467 (SSUv2) release. Well, it appears that Microsoft “messed up” (?) – big. Again. You see, KB4490628 (the 2019 SSUv3 package, digitally signed with and using a build date of February, 2019) is version 6.1.1.2, marked – wrongly – as an “Update” Package (like SSUv1 was) and not – rightfully, as expected – as a “Security Update” Package (like SSUv2 was). Meaning, the version numbering increment got messed up again: SSUv1 was v6.1.1.1, SSUv2 was v6.1.2.5 and SSUv3 is now v6.1.1.2! Problem #1: Because KB4490628 (SSUv3) is missing the extended package ‘exclusive=”true”‘ metadata tag, it will NOT remove KB3177467 (SSUv2) automatically. Thus, if you install KB4490628 (SSUv3) you will mess up your Windows 7 Servicing Stack and end up with both KB4490628 (SSUv3) and KB3177467 (SSUv2) installed. Now, sit tight and get comfortable (this is tricky – and messy): the KB4493132 “EOL nagging package” is version 6.1.2.2. See where this is coming (and what the side effects might be)? The apparently “random offering” of KB4493132 might be related with the installed SSU version(s). There might be dragons. And multiple, unforeseen conflicts coming up. Microsoft’s (bad? intentional?) decision to increment version numbering by “rolling back” from SSUv1 up to SSUv3 (OVER SSUv2, which has a HIGHER value than SSUv3!) may very well be messing up the Windows 7 Servicing Stack (again) and creating additional conflicting scenarios. Regardless of what you did with SSUv1 after installing SSUv2 (I simply removed it, because I still don’t see any point in keeping a superseded leftover; others preferred to keep it, like GTP did – but it really doesn’t seem to matter, at all), installing SSUv3 “as it is” right now is, IMHO, a bad idea and a risky move. If you happen to do so you WON’T be able to uninstall SSUv2 (since it has a HIGHER version than SSUv3) and you WON’T be able to remove SSUv3 neither! will both fail miserably with a 0x800f0825 error. To revert back the situation you will need to resort to System Restore or a previous image backup. Currently, we can only hope for the best (that Microsoft will eventually realize the goof (?) and re-release a new, fixed KB4490628 (SSUv3) update with a proper version number of 6.1.2.6 or above). Right now, I’m just as clueless as anyone else about what will happen. Fixing KB4490628 (SSUv3) is probably not a top priority to Microsoft. That leaves us (users) with the “choice” (decision) to upgrade, or not, the Servicing Stack (from SSUv2) to SSUv3. I take it the bottom line is, avoid installing KB4490628 ? OK, but any idea why some Win7 folks don’t see 4493132 at all, some get it as Optional unchecked, and some as Important checked? Could it depend on whether you have “give me recommended the same way I get important” checked or not? If the value Professional appears there, update KB4493132 is not offered. Another ‘switch’ checks the key for the value “Enterprise” (and ServerHomeStandard) and also excludes these clients. In this comment at askwoody.com someone had changed the value of the key in Ultimate on Windows 7 Professional. Then the update was offered. I do realize KB4490628 is a separate update from KB3177467 (not only because the KB numbers are different), but shouldn’t the former be replacing (superseding) the latter? And, if so, isn’t the incremental version numbering relevant? In which case yes, the exclusive tag DOES have an interest here and yes, installing multiple SSU versions with conflicting version numbers MIGHT be causing undesired side-effects (of which the fact of the KB4493132 “EOL nagging update” not being consistently offered is a minor issue, compared with the potential problems that might arise due to the SSUs conflicting and blocking each other). I am truly sorry for over-complicating things up (I really tried not to…) but, right now, from what I’m able to understand about the inner details of how SSUs work I can not endorse your recommendation to promptly install KB4490628 (SSUv3) ASAP. Instead, I can only recommend people to WAIT and see if Microsoft releases an updated (fixed?) version of the SSU – that will automatically handle and fix what, in my view, is a complete mess. Most of our readers should stop reading right now and decide if they should, or should not, install KB4490628 (SSUv3) immediately or, at least, wait until we’re at MS-DEFCON 3: what follows below is not for the faint-hearted. with no “Uninstall” option (as expected, because it is a permanent update). I tried WU: it appears to be working well. I rebooted and tried again: all OK. I just dig into the first “main” .mum (of the “package chain”, let’s put it this way, overlooking the fact that the whole package contains multiple .mum files) and didn’t realize that the “final” Servicing Stack version was both at the end of the “package chain” (in the last .mum) and also in the package contents (in the very own name of the sub-directories!). Right. In this case, I simply edited it for “compliance” (and to describe it correctly as a “Security Update”). I see. That explains why KB4490628 won’t remove KB3177467 (only new, updated releases of a given package – or an updated, different package that embedds that one as one of multiple dependencies [chained updates] – may actually remove it). By the way, I purchased 5 “Retail” copies of Win7 Ultimate w/SP1 from “NewEgg” just prior to MS pulling it from retail sales channels primarily for the BitLocker feature for my & my families’ laptops. I’ve also got a few retail Win7 & Win8.1 Pro copies active (& few various old TechNet copies installed in mid 2000’s on some very old Gateway systems I no longer use). How did you get those emoticons (8-ball, etc.) to show up in your post? The only ones I know how to create on this forum are 🙂 and 😉 . Well, my lovely 👰🏻 lets 👴🏻 use (play with) her 🔳 (iPad Air 2) when she’s out 🏃‍♀️⛷🚴🏻‍♀️ or 🛒 for 👚👠👜 and it’s got the 😀 typeface on the ⌨️ with hundreds of 🤗🤠🤡👽🤖🐵🐸🐷🎃. emojipedia.org is a reasonable starting place. Find what you want; click Copy; paste where you want it. As the 🔳 was ⤵️ to 1% 🔋 & about to 🔄📴, I 🔌’ed it in to ⚡️🆙. I then took a ☕️ & 🍩 break while sitting on the 🛋 watching a 🕵🏼‍♂️🗡🔍 mystery 🎞 on 📺. Now that I’m fully ⚡️‘ed 🆙, I can continue. If your 💻 got 🚬’ed due to a nasty🐞🦠🧫 & it’s now in the 🚽 & you don’t have the 🔧 in your 🧰 to 👨‍🔧 it & you don’t have the 🍞 handy or bring home extra 🥓, you’ll probably end up 🚗’ing (if it’s got ⛽️) to the 🏦 for some 💰 for a 🆕💻. You’ll have to ⚖️ your options but if you have a 👨‍👩‍👧‍👦 & really want to hit the 🎯, you could get an 🍎 for 💰💰💰 or if you got a 🚤 or 🚁, go ahead & get the 🍎🖥 for 💰💰💰💰💰. Your 👨‍👩‍👧‍👦 will think you’re 🎅🏻 or an 😇 and your 👰🏻 will 💋 you & bring her 👙 & 💎 on your 🛫 to the 🏖🏝’s in Cabo. Just remember to wear your 😎 & not 🥃 or 🍹 to much especially with 🍱 in the hot 🌞 or it’ll 🥊 your 🧠 like a ton of 🧱 & you’ll be 🌀 & the 🃏 turning 🤢 in the back of the 🚑 being taken to the 🏥 to see the 👨🏽‍⚕️ for some 🔬, a 💉 & some 💊 to prevent 🤮. Of course this will only result in more 💸💸💸 coming out of your 💳 at the local 🏧 & you’ll likely trade in your 🚗 for a 🛴 or 🚤 for a 🛶 when you 🛬 back 🏠. So if you find yourself turning 🤢 like a 🐸 or 🥦, eat a 🍌 & take a cold 🚿. Why a 🍌 … because it tastes the same coming ⤴️ as it did going ⤵️. Well I’m almost out of ⌛️ so I’ll end this 🧚🏻‍♀️📔 & 🧹 it under the 🛏 & have a 🍺 or 🍻 before I go to the 🚻, grab my 🧸, set the ⏰, blow out the 🕯 & go to 🛌 catching some 💤s. You can enable the touch keyboard in Windows 10 by right clicking on the task bar, there are emojis to be found. Microsoft’s Character Map (Charmap) program, Segoe UI Emoji has a few. I whole heartedly concur with & follow DEFCON 3 protocol concerning S/W updates. Though I don’t consider myself a MS OS expert anywheres near the same caliber as some here, I am comfortable “experimenting” on my Windows dual boot test build system usually about a week or so after MS releases updates. This way I can experience 1st hand if I’ll be adversely affected by installing any of them in my particular & mostly common setup(s). Once DEFCON 3 is declared, the rest of my/our working systems are updated as appropriate. By the way, unless there’s some compelling security or operational need not to, I try to follow the DEFCON 3 level approach on all S/W updates from everyone everywhere not only from MS. I usually give Apple iOS updates about a month or so to stew before I attempt installing them and only via iTunes not the Cloud. This way I can have locally saved iOS backups always available should the need ever arise to restore any of our iOS devices. Same goes for any/all 3rd party S/W I use. Well, mine showed up a few days ago as ‘Important’ and UNCHECKED. Yesterday it had changed to ‘Important’ CHECKED. This morning it does not show at all. It did NOT get installed. Has it been pulled?? It does not show up in Windows Update Catalog either. It had showed up in Important, unchecked, for me. I didn’t check again, until today… and it is not showing up for me, anywhere. Double checked… not installed, hidden, checked or unchecked. Missing.